What Types of Probiotics Are Beneficial for Dogs? Probiotics are a big health trend lately. These are beneficial, “good” bacteria/microorganisms that, when consumed, can help your body digest and process the food you eat. That means your gut is happier in general. But what about for our canine companions? Yes, probiotics for dogs are a thing, too. Much like how they help humans, probiotics can help dogs with their gut and digestive health. In fact, in dogs, probiotics have the exact same health benefits as they do for humans when you add them in as a dietary supplement. 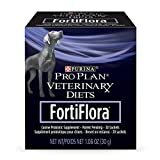 So, if your dog has been having tummy troubles, recently finished a course of antibiotics (which kills off both good and bad bacteria in the gut), or is just looking lackluster (like if their coat looks dull or they have low energy), probiotics could help. 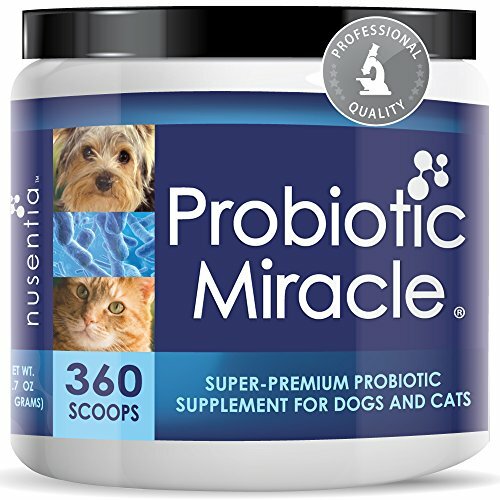 You can buy probiotics for dogs in supplement form. They also occur naturally in many foods your dog will enjoy. When looking for a probiotic supplement, in particular, check the label to see which strains it contains. If the convenience of giving your dog a probiotic supplement daily works best for you, here are some brands you should consider. 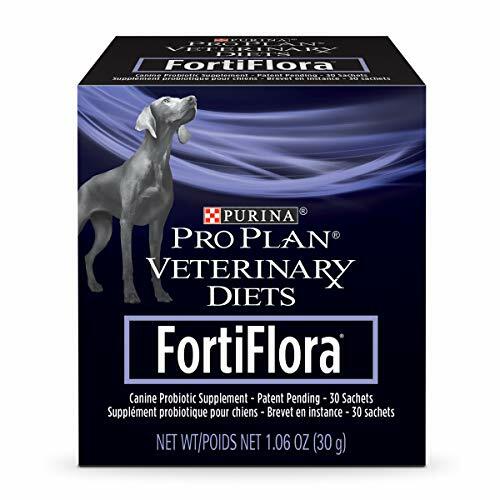 Purina is a well-known brand that makes a good probiotic that’s safe for both puppies and adult dogs. In particular, the good bacteria in this product is helpful for dogs with diarrhea and flatulence. This supplement comes in pouches that you sprinkle over your dog’s food. This highly-rated probiotic can help with skin issues, yeast overgrowth, diarrhea, allergies, and stomach troubles in dogs. It comes in a powdered form with a pre-measured scoop. You add one scoop to food for small dogs and two scoops for larger breeds. The powder disappears into the food and is totally tasteless. 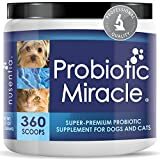 This vet-recommended probiotic contains soil organisms (helpful microorganisms that come from the soil where the natural food we eat grows). 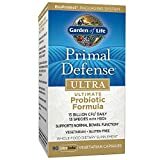 It’s made for humans, but it’s perfectly safe for dogs, especially dogs with digestive disorders that are more serious than occasional flatulence or bouts of diarrhea. Foods that naturally contain probiotics, ones that humans often eat, are also healthy for dogs. If you love eating yogurt, kimchi, or kefir for your digestive health, it turns out your dog could benefit, too. Yogurt is one of the most common foods out there that contains live and active beneficial bacteria. If you choose to supplement your dog’s diet with this human staple, make sure you choose plain yogurt with zero added sugar. Kefir is simply milk that’s been fermented with kefir grains. Kefir is naturally packed with probiotics, plus, it doesn’t have to be dairy-based. You can buy kefir made with coconut milk, water, or almond milk if your dog doesn’t digest dairy well. You can serve kefir to your dog as a snack, or you can add it to their food, gradually increasing the dose over time. If your dog has ever gone rooting through your garbage for “treats,” they’ll probably love fermented veggies. 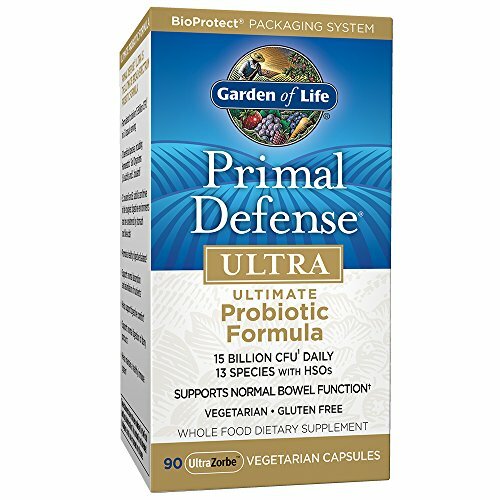 Luckily, these are loaded with beneficial probiotics and enzymes. Kimchi is usually made with cabbage, but you can also find fermented carrots, apples, radishes, and even red pepper. Like kefir, you can feed kimchi to your dog as a snack or add it to their food. Another natural alternative to a probiotic supplement is raw goat’s milk. It has lots of naturally-occurring probiotics, and your dog may be able to digest it easier than cow’s milk, since it has less natural sugars. A few ounces of raw goat’s milk per day is a great natural supplement for your dog’s gut health. Even if your dog doesn’t have tummy troubles or digestive issues, probiotics can help keep them healthier. These little helper bacteria can boost your furry friend’s immune system, aid in nutrient absorption, and can prevent issues like diarrhea and flatulence. Even better? The probiotics you take are perfectly suited for your dog, too, especially the natural kind you find in food. You may find that probiotics are just what you need to optimize your beloved pet’s health for the long-term.